Discussion at Brookings Café is a potpourri of topics around a table where anybody can join in the discussion. This show represents a place where the community of Brookings and the surrounding areas can discuss what concerns us as coastal residents. I n U. S. history over 300 million people died from smallpox, a disease that is virtually wiped out today because of the smallpox vaccine. But despite the obvious good that has come from vaccines, there is a growing trend of people who refuse vaccinations. Now we have an outbreak of measles which is another potential killer. Are we as a nation, as a world being put at risk because of people who choose not to vaccinate? That’s the discussion at Brookings Café, on KCIW. 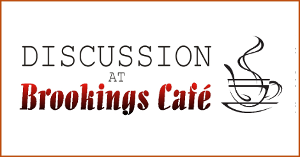 Brookings Café … a discussion about what’s important to you. The opinions expressed here are those of the individual participants. Curry Coast Community Radio takes no position on issues discussed in this program. Music is Road Song, licensed from audioblocks.com. Discussion at Brookings Café: What is Democracy? After a flurry of “letters to the editor” in the Curry Coastal Pilot, the question arises: do we really know what a democracy is? Here the panel tackles the question of different types of democracies, the pros and cons and what this all means to us, citizens of the good ol’ U S of A. It can be confusing since we call our democracy a republic, and sill other countries are autocracies. Do we really have the power as people, or are we merely pawns in a big system that is out of control? That’s the discussion at Brookings Café. Oregon is a right to die state. But that doesn’t mean that exercising that right is easy. It isn’t easy, and a lot of people suffer needlessly because of all the paperwork, the cost, the waiting, and sometimes travel that all take a toll on what should be a sympathetic process. Often people die from their terminal illness before the process is complete. But wait, there are even more hurdles. Here host Dan Sherman and guests Lynne Denne, Ray Gary, and Lee Tuley discuss the issue in depth. Fasten your seat belt. This isn’t what you think it is! Discussion at Brookings Café: Paranormal? Really? Is there such a thing as paranormal? Are ghosts real? What about mental telepathy? This handful of panelists tell spooky stories they’ve experienced while others debunk the idea that there is such a thing as paranormal. But still, exploring possible explanations for UFOs, psychokinetic phenomenon, and communication with other entities in the universe. This episode offers a little bit of everything. Perhaps you have a story to share. There can always be another discussion on the subject, and you can come. Hosts Dan Sherman and Ray Gary were pleasantly surprised talking about physical fitness with Ken Dobberpuhl, who teaches fitness at the Southwestern Oregon Community College. Not your usual drill sergeant style approach, but rather Ken specializes in fitness for people who are in their later years. It’s described as a practical approach rather than a given set program, recognizing the differing needs of different people. And as a bonus, they discuss how Ken Dobberpuhl is going to put together a regular show for KCIW. KCIW looks forward to his new program. The opinions expressed here are those of the individual participants. Curry Coast Community Radio takes no position on issues discussed in this program. The information provided is not intended to substitute for professional medical advice. Always seek the advice of your personal physician or other qualified health care professional before changing your healthcare treatment, diet, or lifestyle. In this edition of Discussion at Brookings Café, regulars Ray Gary and Dan Sherman talk with Scott Thiemann about the Master Gardener program, invasive species, and a handful of other plant topics. From nasturtiums to blackberries and begonias we, discuss the coastal phenomenon, the advance of plant species that are not native to this area, and what that means to us. This discussion answers a lot of common questions because we asked a lot of stupid questions. Join us for an informal look at what’s growing in your backyard … and invading your living room. You can contact Scott Thiemann at scott.thiemann@oregonstate.edu. Discussion at Brookings Café: Hey Brookings, How are U? Hello Brookings. How are you doing? Well, the City of Brookings can’t really answer that question, but perhaps we can. Here is the first in a series of discussions to essentially ask the question – How are we doing? And what lies in our future? Can we expect prosperity in the next few years or do we need to make some changes? A real estate agent and a business leader weigh in on how we are doing. This is a special edition of Discussion at Brookings Café covering the topic of homelessness in our community, hosted by Curry Coastal Pilot staff writer Boyd Allen. 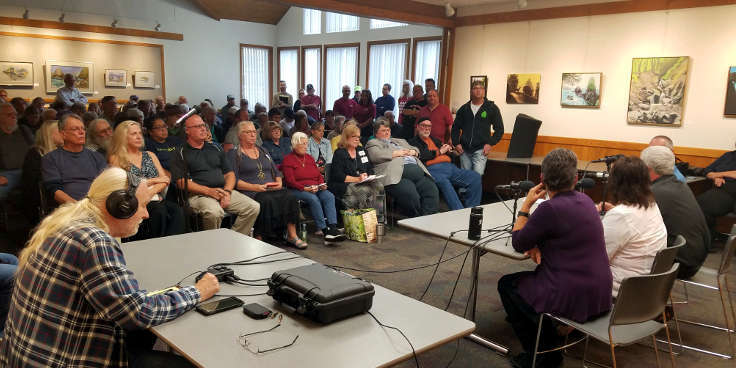 It was recorded before a live audience at the Chetco Community Public Library. The first half of the show is a panel discussion with panelists Father Bernie Lindley of Saint Timothy’s Episcopal Chruch in Brookings, AllCare Health Board Member and Chair of Curry County Community Advisory Council Georgia Nowlin, and Beth Barker-Hidalgo, Board Chair of the Curry Homeless Coalition. A question and answer session followed the discussion. A number of people gave opinions, including homeless people who spoke of life from their point of view. This is a two-hour long show, but well worth the listen. Consider listening in two sessions. Are there really children being held prisoner on Mars? Are the dead children from the Sandy Hook School Massacre really alive and well because they were paid actors? What about those planes that slammed in the Twin Trade Towers; were they really just holograms to cover a government plot to blow up the buildings? Conspiracy theories … that’s the discussion at Brookings Café. Every once in a while we feature a special discussion at Brookings Café, an open discussion where there is no set topic in advance, we leave it open for people to bring in their own topics. As producer of the show, I like to think that the table here is a radio version of letters to the editor, where people have the chance to express their thoughts without being limited to 500 words. We started talking about garbage, pollution, and recycling. Here’s that discussion.